(1) Visit the right place in the right season, which is usually during the shoulder-season: don’t visit Paris or Rome in August if you want to see locals and visit places frequented by locals, and not only tourists. On the other hand, Ibiza off-season can be cold and rainy and most of the restaurants and clubs are closed. (2) Don’t ask for advice from someone who visited a place 10 years ago. A pristine beach can get ruined quickly, and a city can be flooded with tourists once an international airport is built nearby. I visited Railay Beach near Krabi, Thailand around 1990 and it was one of the most pristine beaches I have even seen. On a recent visit I was disappointed to see that the area has been overbuilt, with motor boats zooming all over. Thailand has been particularly affected by the proliferation of discount airlines and chartered flights to small local beach resorts. 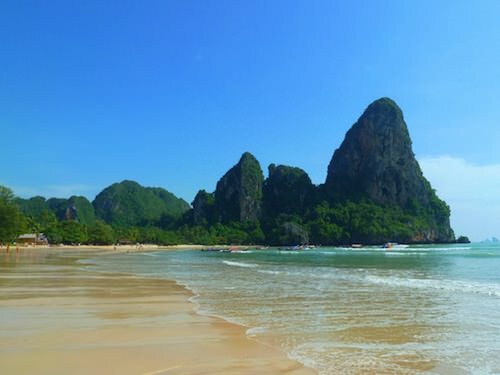 Railay beach: where are the crowds? (3) Top 3 tourist sites get 95 percent of crowds, so go to less crowded monuments. 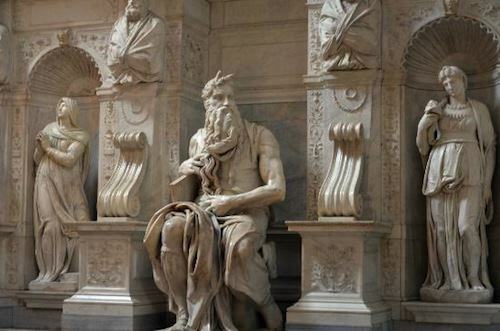 There are great churches in Rome which will be empty and much more enjoyable than the Vatican, such Saint Peter in Chains where a magnificent statue of Michelangelo’s Moses can be found. (4) Take it easy: Stay multiple days in a place, walk/bike rather than drive. Too many travel guides follow the Michelin focus on driving rather than on being outside in the fresh air or on the street getting a feel of a foreign city. Pick a few nice places, stay there and explore the region by foot or by bike. If you like the area, come back again and explore some more. (5) Expensive places attract old and nouveau riche crowd: Stay in small boutique hotels rather than in landmark city hotels or chain hotels. You may not be able to brag, but you will get to stay with a hip crowd in a cool area and it will be lighter on your wallet. The true gems while travelling are small low-key places that have not been written about in the guide books – keep checking Mapplr Hotels for our top recommendations. (6) Give young chefs a chance and avoid Michelin-star places. Nola in Copenhagen is passé – find other places on Mapplr Hottest New Restaurants in Copenhagen. Like hotels, once a restaurant becomes too well-known, the prices go up and the quality declines (or at least the menu becomes more conservative). (7) Never eat at a restaurant with big signs in English outside (In a non-English speaking country). Avoid eating on main touristy streets and squares. Small places in back alleys and side streets are usually good bets – they will be cheaper and attract locals. In San Francisco, avoid Fisherman’s Wharf and Union Square at all costs, and head for the Mission or SOMA for better food. (8) Fly non-stop if possible: You will spend what you saved on airfare at airport restaurants and will arrive to your destination exhausted if you fly via a connection. Also, your miles are not worth much these days, so fly Air France directly from SFO to Paris rather than saving money and flying from SFO with Delta via NYC and risk getting delayed in a snowstorm. If you have to make a connection in Europe, choose pleasant airports with little delays such as Munich, Zurich or Amsterdam, and avoid London Heathrow or Paris CDG. (9) Fly mid-week as flights are cheaper and airports are less crowded. Fly midday flights for the same reason (business people usually fly in the morning so airlines charge a premium for early morning flights). Use sites like Seat Guru to find the best seats on a flight and pay extra money for them. I am always puzzled by those who will buy several beers on the flight, but will not spend the same amount (or even less) to purchase an emergency row seat with more leg room and space. (10) Use discount airlines to avoid busy airports: in Europe, use EasyJet to fly to Paris Orly Airport rather than to Charles de Gaulle Airport. If you are going to Manila (Philippines), use Cebu Pacific to avoid the terrible Manila International Airport’s Terminal 1. Cebu Pacific uses the newer terminal which is largely free of delays. Discount airlines are as safe as mainstream ones (even in Asia), and usually their planes are much newer, the staff more motivated, and their on-time record better so give them a try. Following these Top 10 Travel Tips will still require you to plan and research your destinations and airline options, but they can greatly improve your overall travel experience. Safe travels! Worth mentioning that you should consider hiring a knowledgeable guide to help you plan your trip and help you feel like a local. Agree. A good local guide can also save you more than their fees in savings at hotels, restaurants and shops, not to mention wasted time. Right! It is idiocy to ask a friend or fellow people that have visited the place year ago. I too have experienced and was not satisfied with the trip though it was a one-day journey. Nice tips for travel. I would share these with my buddies.